The current week's homily is available on a link on the front page of the website next to the link for the current week's bulletin. On the page with the prior bulletins, the corresponding homily will be sitting side by side with its bulletin. We started on the anniversary of the start of the Catholic Church, Pentecost Sunday --- just over one year ago. This week, the Thirteenth Sunday in Ordinary Time, is our seventy-second podcast to be posted. This week, the homily is given by Father James Brady, our new pastor. 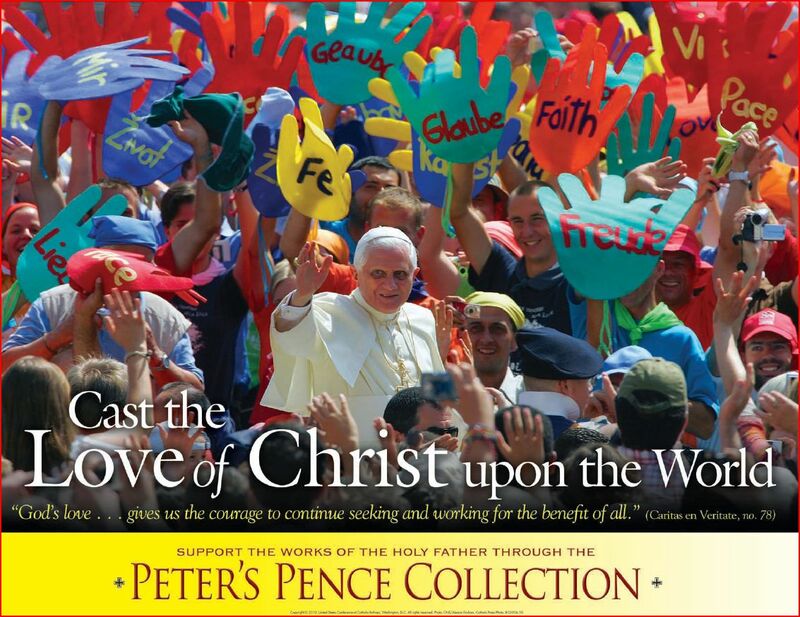 This weekend, the second collection will be the Peter's Pence Collection. The Peter’s Pence Collection provides the Holy Father with the assistance he needs to carry out his most important charitable works. The proceeds benefit the most disadvantaged: victims of war, oppression, natural disasters, and others. Pope Benedict XVI has said, “God’s love . . . gives us the courage to continue seeking and working for the benefit of all” (Caritas in Veritate, no. 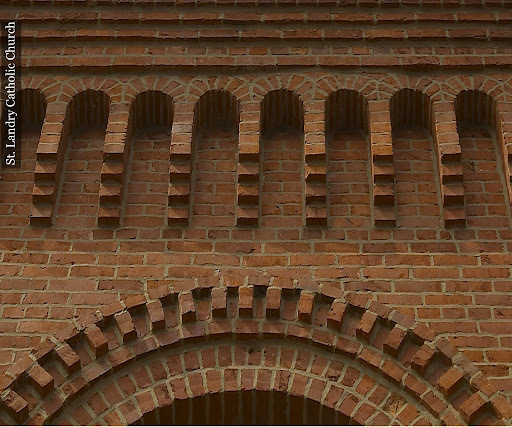 78). Cast the love of Christ upon the world—please be generous in today’s Collection. Nazareth Boys Town in Mbare, Rwanda, received assistance from Pope Benedict XVI to take in abandoned orphans who are victims of genocide and civil war. Casa di accoglienza Giovanni Paolo II Opera Don Orione is a residence that gives free shelter and specializes in helping special-needs pilgrims to travel to Rome. It was recently refurbished through assistance provided by the Peter’s Pence Collection. In Bosnia, the Hospital of St. Vincent de Paul, a health institution in Sarajevo staffed by religious, was established with support of the Collection. The second reading this weekend reminds us that our abundance must supply the needs of others. Jesus became poor, so that we might become rich. We are called to follow his example by giving of our time, talent, and treasure to help those in need. Hello St. Landry Church. My name is Alexander Albert and I am the seminarian assigned to your parish for the summer. 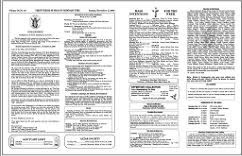 I just finished my first year at seminary and will be classified as a junior at St. Joseph Seminary College (a.k.a St. Ben’s) this fall. I grew up in Kenner, La. which is just west of New Orleans. I have two brothers, one older and one younger. My parents are married and live in Semmes, just north of Mobile, Al. They moved there about a year after Katrina hit our home because my mother’s job relocated and offered incentives to pay for moving costs. As for my education, I went to public school in Kenner until 5th grade, when I transferred to our Lady of Perpetual Help Catholic School. From there I attended Archbishop Rummel High School. I graduated and went to UL where I majored in Middle School Education for three years. 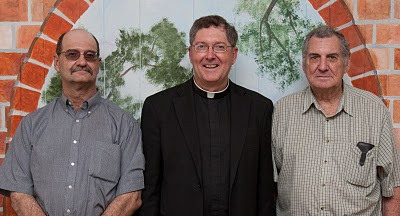 During that time I began to grow in my faith with guidance from Our Lady of Wisdom student center and eventually discerned the call to the priesthood. After finishing my junior year at UL, I transferred into St. Ben’s with enough credits to classify me as a sophomore there. Because Wisdom was so integral to my discernment, I decided to enter under the Diocese of Lafayette with Wisdom as my home parish. I enjoyed my first year at seminary and should be ordained, God-willing, in about 6 years. I look forward to working in the parish and getting to know the community. Spring Hill College in Mobile, AL and received a degree in accounting in 1987. After college he attended the University of Mississippi School of Law where he received a juris doctorate in 1990 and then moved to Lafayette where he practiced law for 11 years. In 2001 Fr. 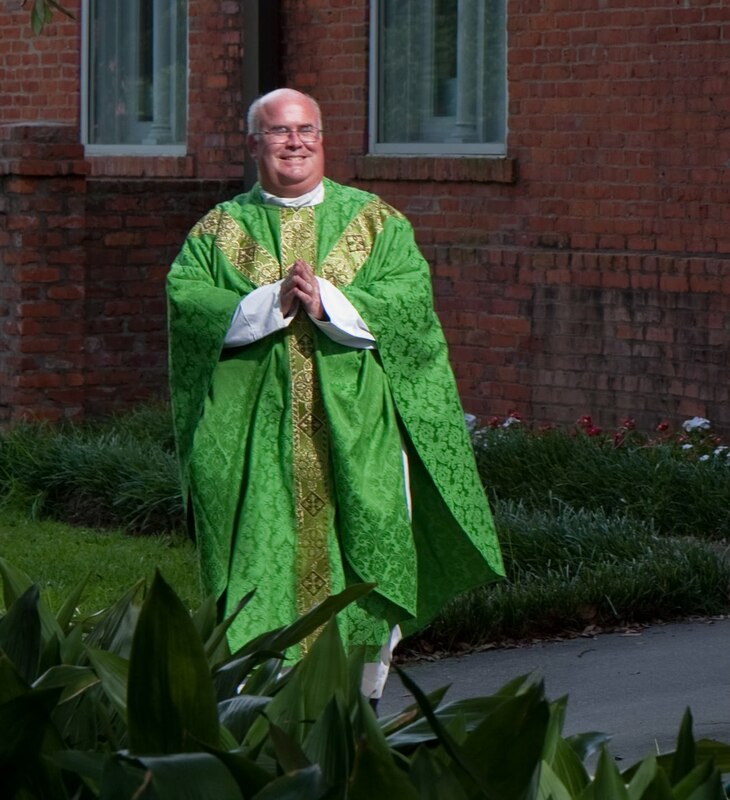 Brady entered formation for the priesthood and attended Notre Dame Seminary in New Orleans. 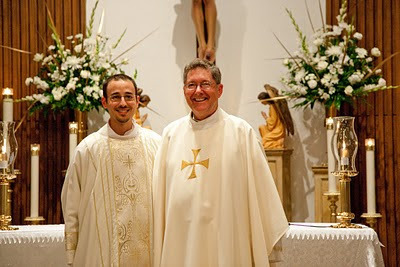 He was ordained a deacon in January of 2006 and a priest in July of the same year. 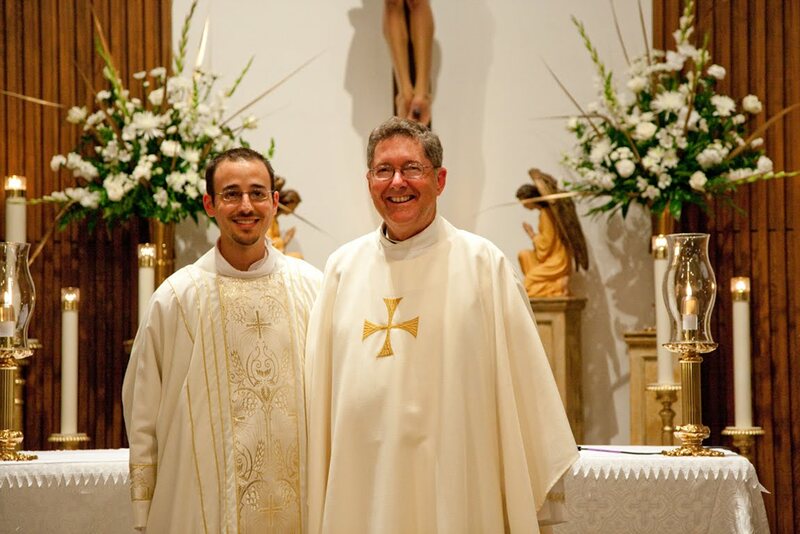 After ordination, he was assigned to study Canon Law at Catholic University of America in Washington, D.C. and received a degree May of 2009. Since that time, Fr. 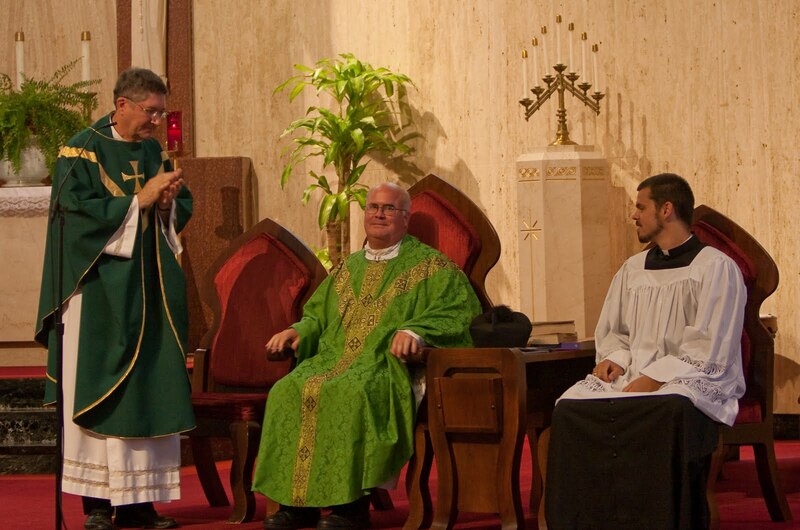 Brady has been serving as associate pastor of St. Michael’s Church in Crowley. BLOG EDITOR'S NOTE: Just as in the parable that showed the good in the Samaritan, we need to be able to embrace our Yankee/Ole Miss new pastor (very big smile). Welcome Father Brady! On the Google Home page, there is a link in the lower left hand corner that allows you to pick an image downloaded to your PC as your image. 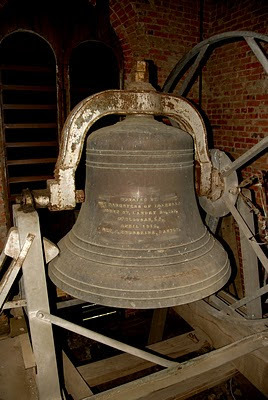 I've just posted a few new photos of the St. Landry Bell, compliments of Dr. Richard Harmon. Our friend James, over at the Opinionated Catholic, has commented about a new initiative to provide the text of altar missals on the new iPad tablet computer. He comments here and gives references back to another blog here and then back to a news article here. To be clear, the Church isn't going to an electronic missal on the altar any time soon. But there is new software that demonstrates that it is functionally possible. The person behind the initiative is Father Paolo Padrini, the same person who developed the iBreviary app for the iPhone and iPad, iBreviary Pro, and the Pope's social networking site: http://www.pope2you.net/. The iBreviary Pro app is a wonderful app that I use on my iPhone. It contains the full Liturgy of the Hours, all of the readings for the day's mass, the full missal text including the full order of the mass, and many prayers. It is all available in multiple languages including English and Latin. For years, I carried my own missal to mass. In the case of weekday masses, I have two small missals depending on what part of the year it is. And I have another missal for Sunday mass. But, once I could access them via my iPhone, I stopped carrying them. I have full access, nice and back lit, right on my iPhone. I can adjust the size of the print for easier reading. And it's _always_ with me. I also make notes to myself on the iPhone during the homily, especially when the homilist references the Catechism and the Compendium. I have copies of each of them on my iPhone as well that I can refer to easily. I prefer to pray the Liturgy of the Hours using one of the four leather bound volumes that applies to the current day. On occasion, though, I'm later than I planned on business or something comes up that I don't have the leather book with me. Being able to pray that particular hour of the day by using the iPhone in my pocket makes life easy. When you consider that the cost of a set of books to pray the Liturgy of the Hours can be around $150, the free price of iBreviary Pro is very attractive. Also, many laymen learning to pray the Hours are intimidated by having to move the ribbon place markers around within the Liturgy of the Hours in the books to figure out what needs to be prayed. The iBreviary Pro puts everything in order so all you have to do is pray. It's a great way for a layman to get his feet wet and decide to acquire the books ... and it can help teach you how to use the books. Now, being a layman in the pews utilizing an iPhone or iPad isn't the same as using one on the altar. But there are positives there as well. Being able to adjust the print size can be helpful. It can be on the correct page always without having to flip through the book. Lectionaries and altar missals are large and expensive. Electronic versions can be a lot less expensive. In the case of the new translations of the mass that is coming out in the next year or so, we're waiting on the long ramp up time for publishers. 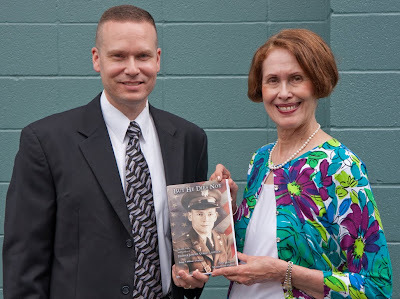 With an electronic reader, the changes could be sent out instantly to electronic missals. All that being said, one thing James compares this to is the use of wax candles for the liturgy. And there, I think he's touched on an important point. There is something organic about the mass --- in its history and development. Wax candles add to that authenticity and symbolism. Proper chalices and vessels add to that. And I think the richness of a heavy, paper book adds to that as well. The use of an iPad as a missal reader may have applications. In a "travelling kit", where a priest has small vessels in a case, it might be very functional to use an iPad as the missal. Overall, though, within the context of an established church, I don't see it being the preferred form for a missal. Last Sunday’s ‘Thanksgiving and Appreciation party’ was great. I appreciate the love I experienced in so many people. Your kindness is wonderful. I would like to say thanks to all who organized the party and to all who cooked the food and prepared items and who provided the environment. It was such a wonderful graced-filled event. Everything was wonderful. Thank you for your love. I love you, too. I will miss you. I will continue praying for you. May God bless you! He was pierced for our sins. “My soul is thirsting for you, O Lord my God”. We are children of God in Christ Jesus. We take up again the Sunday-by-Sunday reading through the Gospel according to Luke that was interrupted by Lent and Eastertime. We find ourselves at a great crescendo in the Gospel as Peter identifies Jesus as the Messiah. Jesus throws cold water on this declaration of faith by reminding the disciples about the Messiah’s sorrowful fate. And the followers of the Messiah must share this fate. How can you follow the example of John the Baptist and tell others about Jesus this week? John the Baptist was sent ahead to prepare people for Jesus’ message. How does your life, including your words and actions, help others to know what it means to be a follower of Jesus? What can you do this week to spread the good news about Jesus? Jesus asked his disciples, “Who do the crowds say that I am”? They respond with several names or possibilities. Then Jesus asked, “But who you say that I am”? Now the question is personal. To answer they must reveal what is in their heart and head. Peter said, “You are the Messiah of God”. That took great faith and courage. “If anyone wishes to come after me, he must deny himself, take up his cross daily, and follow me”. We may be relieved that we were not present with Jesus two thousand years ago. But Jesus is present with us today—in the Eucharist, in His Church. He asks each of us, “Who do you say that I am”? How do you answer him? Are we willing to accept the consequences? The bulletin for the week of June 20, 2010 has been posted. Click here to see it. Today, during his homily, Monsignor Romero referenced the Compendium of the Catechism of the Catholic Church and the Catechism of the Catholic Church. These are a wonderful references to Catholic teaching. During the homily, Monsignor Romero referenced questions 422 thru 423 of the Compendium. Then, Monsignor referenced paragraphs 1993 thru 1995 in the Catechism. Justification is the most excellent work of God's love. It is the merciful and freely-given act of God which takes away our sins and makes us just and holy in our whole being. It is brought about by means of the grace of the Holy Spirit which has been merited for us by the passion of Christ and is given to us in Baptism. Justification is the beginning of the free response of man, that is, faith in Christ and of cooperation with the grace of the Holy Spirit. 423. What is the grace that justifies? That grace is the gratuitous gift that God gives us to make us participants in his trinitarian life and able to act by his love. It is called habitual, sanctifying or deifying grace because it sanctifies and divinizes us. It is supernatural because it depends entirely on God’s gratuitous initiative and surpasses the abilities of the intellect and the powers of human beings. It therefore escapes our experience. 1994 Justification is the most excellent work of God's love made manifest in Christ Jesus and granted by the Holy Spirit. It is the opinion of St. Augustine that "the justification of the wicked is a greater work than the creation of heaven and earth," because "heaven and earth will pass away but the salvation and justification of the elect . . . will not pass away." He holds also that the justification of sinners surpasses the creation of the angels in justice, in that it bears witness to a greater mercy. Just as you once yielded your members to impurity and to greater and greater iniquity, so now yield your members to righteousness for sanctification. . . . But now that you have been set free from sin and have become slaves of God, the return you get is sanctification and its end, eternal life. The current week's homily is available on a link on the front page of the website next to the link for the current week's bulletin. On the page with the prior bulletins, the corresponding homily will be sitting side by side with its bulletin. We started on the anniversary of the start of the Catholic Church, Pentecost Sunday --- one year ago. This week, the Eleventh Sunday in Ordinary Time, is our seventieth podcast to be posted. This week, the homily is given by Monsignor J. Robert Romero. So, take a listen and let us know what you think. Click here to download the Eleventh Sunday in Ordinary Time homily from St. Landry Catholic Church, Opelousas, Louisiana. 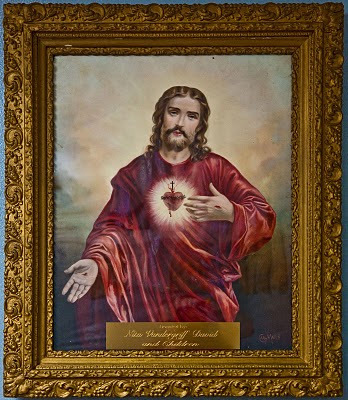 Today is the Feast of the Sacred Heart of Jesus. Below, you'll find instructions to pray the Chaplet of the Sacred Heart. Blood of Christ, inebriate me. Water from the side of Christ, wash me! Passion of Christ, strengthen me! O good Jesus, hear me. Within Your wounds, hide me. Permit me not be separated from You. From the malignant enemy, defend me. At the hour of death, call me and bid me come to You; that with Your Saints, I may praise You forever and ever. Amen. Mary, Mother of God, be my love. May the Heart of Jesus in the Most Blessed Sacrament be blessed, adored and loved with grateful affection at every moment, in all the tabernacles of the world, even to the end of time. Amen. The Lord forgives David’s sin. Jesus forgives the woman's sins. This first Sunday in the very long stretch of Ordinary Time that will bring us to the threshold of Advent roots us firmly in the Gospel of Saint Luke. Today we listen to the story of a meal that Jesus shares in the home of a Pharisee. At that meal, the Lord has something to teach this Pharisee and something to teach us about the nature of the Eucharist. May today’s word be one of reconciliation and hope for each one of us and for our Church. This week, how can you welcome someone in your neighborhood who is feeling left out? Jesus was able to see the faith of the woman, even though she was a sinner. Who is in need of your forgiveness, even though they have done you harm? What is one way that you can offer forgiveness to someone in the weeks to come? How can you show compassion toward the marginalized members of society today? "The one, I suppose, whose larger debt is forgiven." Kenny Rogers sings a Country Western Song, “Oh Lord it is hard to be humble when you are perfect in every way”. Could it be our theme song? Is the fact that we might be mistaken or wrong pretty far down on our list of possibilities? And we are proud of that? The ability to admit that we are in error or have done evil does not come easy. For many people, the three most difficult words are not “I love you”, but “I am wrong” and “I am sorry”. And there is the always difficult “I forgive you!” Contrary to the song by Kenny Rogers, true humility is the willingness to say, “I am wrong”! and “I am sorry!”, when necessary. And sometimes the best way we can give is to forgive. And the more we feel we have to forgive, the more we need to give. God gave us all that we have and are. Have we used all of god’s gifts as he intended? If not, have we said, “I am wrong” and “I am sorry”? Our God is an awesome God. He wants to say, “I forgive you”! in the Sacrament of Reconciliation. When was the last time we took advantage of that blessed Sacrament? Well, that is too long! Look for God’s presence and gifts. See Jesus reflected in the faces, words, and actions of others. Know that your call to discipleship and stewardship commissions you to also imitate Christ in all aspects of daily living. Give yourself summer gifts of time for contemplation, prayer, and spiritual reading to enhance your relationship with God. Keep Mass attendance a priority throughout the summer months. Look for opportunities to “pay forward” kindnesses received from others. Gift others with caring words, acts of service and gracious hospitality. The bulletin for the week of June 13, 2010 has been posted. Click here to see it. This is a reposting from the blog last year. St. Landry’s feast day is today, June 10th. Who is St. Landry? St. Landry is a former Bishop of Paris, France, being consecrated Bishop of Paris in 650. On becoming Bishop of Paris, St. Landry saw the need of a proper institution for the care of the many sick poor of Paris. St. Landry built the first major hospital in Paris and dedicated it to St. Christopher. The hospital later changed its name to the Hotel-Dieu and is still open today. St. Landry is known for his generosity in times of famine and for his concern for the suffering poor. There are many stories that describe him selling off his possessions to help. He is the patron of our church parish as well as our civil parish here in Opelousas, Louisiana. The Landry name is also a common surname for Cajun families in south Louisiana. 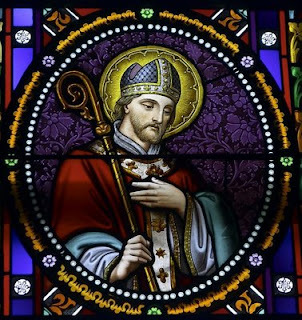 Almighty God, you made St. Landry an outstanding exemplar of Divine love and faith that conquers the world and added him to the role of saintly pastors. Grant by his intercession that we may persevere in faith and love, and become shares with St. Landry in your glory. We ask through Christ our Lord. Amen. The current week's homily is available on a link on the front page of the website next to the link for the current week's bulletin. On the page with the prior bulletins, the corresponding homily will be sitting side by side with its bulletin. We started on the anniversary of the start of the Catholic Church, Pentecost Sunday --- one year ago. This week, the Solemnity of the Most Holy Body and Blood of Christ, is our sixty ninth podcast to be posted. This week, the homily is given by Monsignor J. Robert Romero. So, take a listen and let us know what you think. Click here to download the Solemnity of the Most Holy Body and Blood of Christ homily from St. Landry Catholic Church, Opelousas, Louisiana. Over bread and wine, the mysterious Melchizedek blessed the Lord. "You are a priest for ever, in the line of Melchizedek." Every time we eat the Lord's body and drink his blood, we proclaim his life giving death. The feeding of the multitudes. Jesus continues to offer himself to us and feed us in the Holy Eucharist. The miracle of the multiplication of the loaves and fishes stands as a reminder to us of the abundance of God’s generosity. As we listen to this remarkable story, let us ask God to do what may seem impossible to us, just as the feeding of the multitudes seemed impossible to the disciples. The things that seem so out of reach---world peace, justice of the oppressed, ood for the hungry, shelter for the homeless, an end to terrorism----can become a reality when we become what today’s festival calls us to become: the very body of Christ sent forth to a hungry world. How can you share what you have received from Jesus with others this week? Each week when we celebrate the Holy Eucharist, we are asked to "do this in remembrance of me". How else do you acknowledge the importance of Jesus in your life? Through prayer? Through the ways that you treat others? How can you prepare yourself to be nourished by Jesus in the Eucharist this week? None of the Gospels tells the exact details of how four or five thousand men, plus women and children, are fed with a few loaves and two fish. The Church teaches us that the miracle of the multiplication of loaves and fish was a prefiguration of the Body and Blood of Jesus. But let us consider another miracle, just as great. Jesus knew the Semitic ethic that required people to share with others. He knew people carried food and wine under their garments, but refrained from taking it out for fear others had not brought their own. Note that Jesus blessed the loaves and fish and gave them away. He did not keep any for himself. Did people see his generous act and decide to share what they had with one another? In the context of God’s gifts to us of reason and free will—the ability to choose to be generous or not to be generous, what is the greater miracle: multiplication of loaves and fish, or multiplication of generous hearts? Which makes us a greater witness to the Real Presence of the Body and Blood of Jesus in the Eucharist? Think back to the time(s) you first felt loved. How did you notice the feeling? What circumstances gave you the awareness of another’s care and connection to you? How has your sense of being loved grown over time? Using your personal experiences, in what ways do you show others your care and love in daily life and in special ways? The bulletin for the week of June 06, 2010 has been posted. Click here to see it.